The internet is finally on - Yay! Our move went fairly smoothly. It's sooo nice being in our very own home. I tell everyone that I could live here forever! 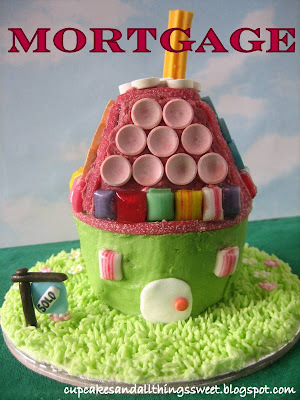 I've waited so long for a Mortgage, oooops, I mean Home! Good things do come to those that wait. Our home before was a 2 bedroom unit with NO yard! We now have a yard for the kids to enjoy. What's with the umbrella you might say? Kevin Rudd (our PM) is giving a $1600 rebate to those who get ceiling insulation, wahooo! So come 1 July, you know what i'll be getting.....free ceiling insulation. Okay, enough about my home. 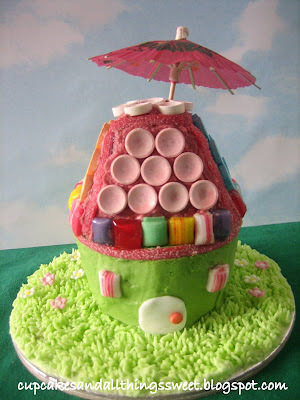 How cute are cupcakecottages! 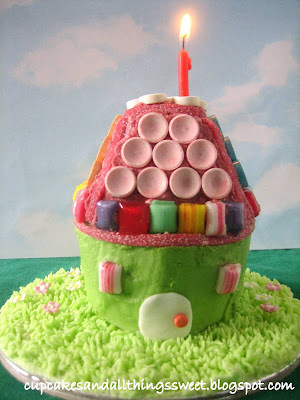 I think this would make a wonderful 1st birthday cake with a candle as the chimney. 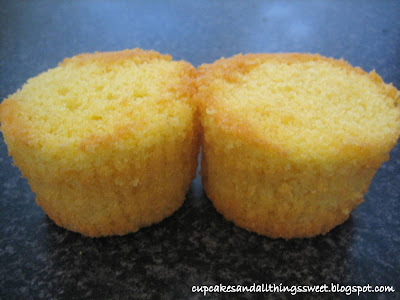 Level the tops of two texas sized cupakes. 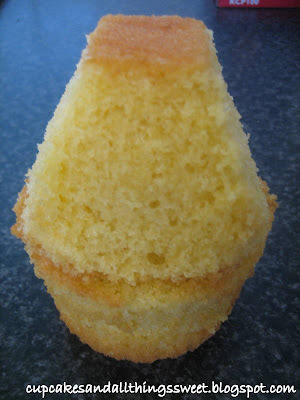 I've tried normal sized cupcakes and they work fine too, you'll just have to find really small sized lollies. 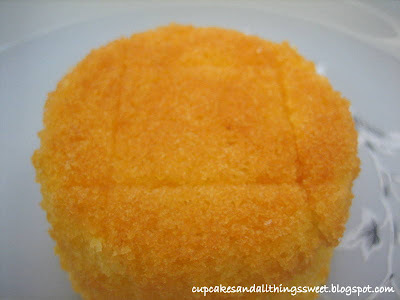 As a guide I marked out a square on the bottom of one of the cupcakes. Now you need to cut from the side of the square down on an angle. Sandwich the two halfs together with icing. 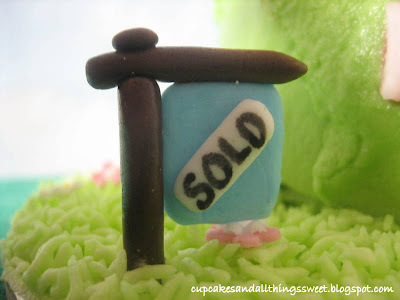 Ice the roof with one colour then ice the bottom cupcake with a different colour icing. 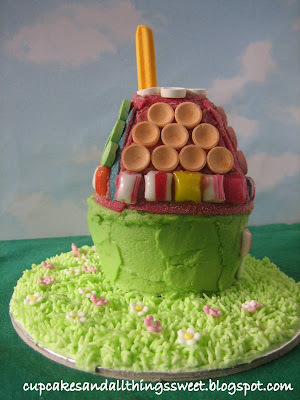 I decorated my roof with fruity stap things cut to size for the edges, round fizzy lollies for the roof tiles, Bo Peeps (from Darrell Lea) and a fruit stick for the chimney. I used sugar paste for the door and handle and Bo Peeps for the windows. Yay for cupcakes! Yay for mortgages! I wish you every happiness in your new home. It is so good to have you back! That cottage is FAB! I might use it as a gingerbread house alternative next year! Congratulations to you and your family on your house and BACKYARD! You forgot to mention the other addition to your family - the lawn mower and Saturdays spent weeding and edging etc!! love the cupcake.. i love the gingerbread suggestion up above... what a GREAT IDEA!! I've got to try this! This is so precious!